Hacienda Del Sol is at the top of Tucson’s treasured memories list in Tucson history. The striking architecture of the Hacienda Del Sol was influenced by the Moorish styles of the 18th and 19th centuries. The Spanish Colonial structure provides a secluded escape to Tucson’s past. It is nestled in the Catalina Foothills of the Santa Catalina Mountains. The beautiful facility has had a storybook existence. 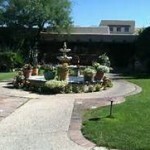 Starting out as a ranch in the early 1900’s it become on of Tucson’s premier resort and dining experiences. Along the way it had many lives. The late 1940’s saw the Hacienda Del Sol become a guest ranch. In the late 1940 and 1950’s many notable movie stars used it a a hide away. Katherine Hepburn, Spencer Tracy, Clark Gable, John Wayne and Howard Hughes could be seen there. After being in the spot light for many years, the Hacienda Del Sol faded from notoriety. It languished in relative obscurity until the mid 1990’s. A group of Thessalonians purchased the property and worked to bring it back to its rightful place in Tucson history. Renovations were made and in 1997, “The Grill” was added to the facility. The Hacienda Del Sol is not only back on the map, it is at the top of the list. Its one of a kind setting, impeccable facilities and the dining experience of The Grill are hard to find anywhere. Awards by the many notable travel publications have been bestowed on the Hacienda Del Sol. The word “Best” is found in most all of them. Residence and tourists find The Grill at Hacienda Del Sol a long remembered experience. An elegant facility, finest foods and first class service are unmatched. Driving Directions: From Oracle and Ina Road go east. For the “out of towners”, Ina Road become Skyline Drive. Just past La Paloma turn right on to Hacienda Del Sol Road. Go south about ½ mile. The entrance to Hacienda Del Sol will be on the right (west) side of the road. Interested in Tucson Real Estate OR a home in the Catalina Foothills? We can help.